Unlike other paintings in which Ned Kelly takes centre stage, in this painting the bushranger is depicted on the far right edge, peering out from behind the mountain which dominates the picture plane. 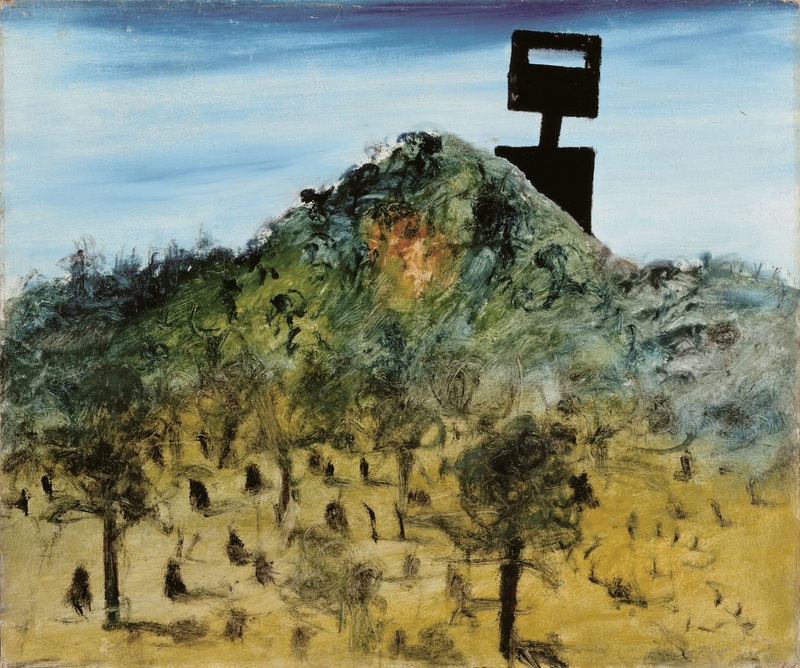 Nolan was as much interested in the mythical presence of Ned Kelly in the Australian landscape, as he was in the inherent qualities of the landscape, invoked by its space and colour. In this painting Kelly appears to embody the landscape, accentuated by the fact that through his helmet we do not see his eyes but rather the blue sky beyond. Kelly’s helmet looms large in this image with a form that closely resembles Russian artist Kazimir Malevich’s iconic black square paintings which were a source of inspiration for many modernist artists including Nolan.